No. 1 Jalen Brunson of the Villanova Wildcats shoots the ball in the first half against the North Carolina Tar Heels during the 2016 NCAA Men’s National Championship game on Monday in Houston. UNC (33-7) gained control in the final minutes by sweeping the glass for rebounds and knocking down threes (hitting 7 of 9 for 77.8%) and went to the locker room with a 39-34 lead, undoubtedly making Michael Jordan, a UNC alum who was in attendance, happy for the moment. 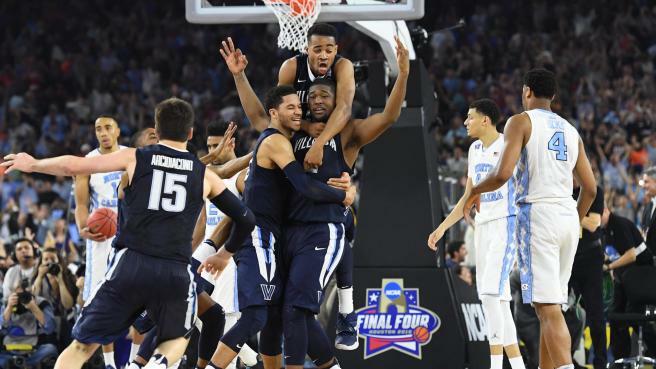 Eight Villanova fans were arrested during celebrations following the game, according to Lt. Chris Flanagan with the Radnor, Pennsylvania, police department. Flanagan says one person was also cited for criminal mischief. A number of injuries were reported: Thirty-seven people were treated at an area triage center; seven people were also transported to a local hospital. Flanagan says all the injuries were minor.